Will you dance to Nokia's beat? Nokia's Music+ service has just launched in the UK, so if you've got a Windows Phone 8-running Lumia, you can now stream higher quality music, and take advantage of some new listening features. The service is an optional extra to the free Nokia Music, and is similar to Spotify Premium, though a lot cheaper. For £3.99 a month, you can listen to tunes offline (handy if you're on the tube), and you can even have the lyrics scroll along the bottom of the screen in time with the track. Which is useful if you fancy a bit of karaoke on the go. Tracks will also sound better, with Nokia promising downloads at eight times the standard quality of Nokia Music. A PC client is also on the way for Windows 8 and Windows RT tablets. The first week of Nokia Music+ is free, then it'll cost you a penny shy of £4 a month. Nokia has a bit of a chequered history with music services. Its first stab, Comes With Music, didn't fare too well, and was rebranded before too long. Nokia Music+ certainly looks a lot slicker, thanks to Windows Phone 8's tile-based UI. 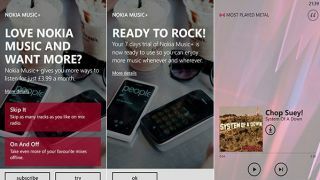 What do you think of Nokia Music+? Can it take on Spotify premium? Let us know in the comments.